I have personally dealt with thousands of breast augmentation patients but have personally never seen a case of BIA-ALCL (Breast implant associated anaplastic large cell lymphoma). This is a rare lymphoma, first reported in 2011, that has occurred in patients with textured breast implants. I am not aware of any cases of lymphoma associated with smooth walled implants. This is not a cancer of the breast tissue itself but a lymphoma (a type of cancer of the immune system) involving the scar envelope that the body naturally forms around any implanted device, called the capsule. The most common presenting symptom of BIA-ALCL is unilateral swelling of one breast years after implantation of textured implants, as a swollen lymph gland in the armpit or a lump in the breast. Recommended treatment entails a complete capsulectomy, implant removal and excision of any breast masses. All cases of BIA-ALCL with the disease limited to the capsule have been cured with a capsulectomy but rarely, the cancer may spread before the capsulectomy has been performed, and then chemotherapy will be required. This is an example of the inside of a capsule removed by Dr. Bunkis from a patient who had had these implants in place for 25 years. Note the bottom part of the capsule contains normal soft scar tissue. 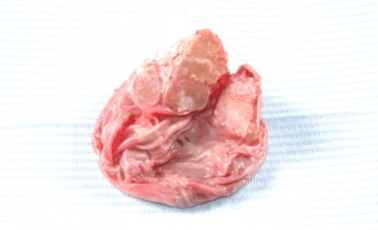 The top portion is calcified and has sharp edges which will always puncture the implant. Finally, let me explain in a few words about implant surface differences. We have discussed the two options, smooth and textured implant surfaces. Originally, all implants had a smooth surface, analogous to a glass table top. In the 1980’s, scientists discovered that adding texture, similar to the surface of a fluffy rug, decreased the chance of capsular contractures from occurring. Over the years, the gold standard was the smooth walled implant but in a few cases where capsular contractures had recurred, textured implants were offered as an option.